In the beginning WordPress was supposed to be software for blogging without that much flexibility. That is why by default your WordPress website usually shows the most recent posts in blog style after activating a new WordPress theme. That of course is fine and does the job, but what if you want to use WordPress as Content-Management-System (CMS) and create more advanced websites? For example you may want to publish fancy online magazines or dynamic news websites, create a flexible business website or else. In that case a simple list of posts usually isn’t sufficient and that’s where a static front page with a particular page template is a great solution for more flexibility. This article covers all you need to know about static front page and you’ll learn how to create a widgetized front page for use with WordPress themes by MH Themes. Why use a static front page in WordPress? Often people want to use their WordPress websites for more than just a simple classic blog, while having flexibility to be creative and express themselve. They want their web projects feel more like real websites powered by a powerful CMS. This is where a static front page in combination with a suitable page template comes very handy. While using a static front page, you can replace the default classic blog view with any static page or page template you like. Most of our WordPress themes rely on a static front page in combination with a fully widgetized Homepage template which you can use to create awesome, individual and flexible front pages based on widgets. In the following tutorial we will cover how you can easily set up your static front page. Important: If you select the widgetized Homepage template which is included in most of our WordPress themes, you won’t need to add any content in the WordPress editor for your static front page because this content will be ignored. Content will be displayed on your front page by using widgets instead. As soon as you have saved these settings in your WordPress dashboard, the static front page with the widgetized Homepage template is set. In this final step, you can now navigate to Appearance => Widgets in your WordPress dashboard and place the widgets in any of the available widget areas like stated in the theme documentation for your particular WordPress theme. 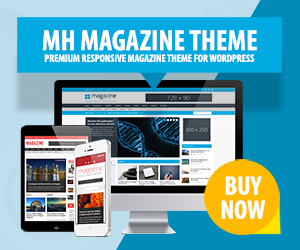 In case you’re using our popular MH Magazine WordPress theme, you can replicate the layout of the various theme demos by simply placing the widgets as stated for each demo and by adjusting a couple of settings for fonts, layout, colors, widget title layouts and more using the provided options. Quick Tip: By default WordPress displays up to 10 posts on archives. You can determine how many posts are being displayed on your archives and blog page by adjusting the “Blog pages show at most” setting in your WordPress dashboard under Settings => Reading based on your personal needs and requirements. So, that basically was all you need to create a static front page (including optional archive / blog page) in WordPress. After you’ve carefully completed the above 3-4 steps to create and set your static front page, you have accomplished the basic configuration of your website which is essential in order to proceed with the configuration of WordPress themes by MH Themes. You can now go ahead and take advantage of all the available features and options within your WordPress theme. That’s also good to know! For better usability and SEO we recommend that you navigate to Settings => Permalinks in your WordPress dashboard and change the default permalink structure to Post name. This will give your posts and pages a pretty URL structure which will help search engines to index your site properly and also help users to navigate on your site. You can learn more about WordPress permalinks in this article: What are permalinks in WordPress. Why do the widgets not appear on the front page of MH Magazine? Hello, I am following your directions exactly but I’ve run into a problem. When I try to set up “Home” page, your directions show a panel on the right side with page attributes to select a page template. I can’t discover how to get that panel to show. Hi Richard, that panel is default WordPress functionality which isn’t related to your WordPress theme. When editing a page (not post), then please click Screen Options in the upper right corner of the page and ensure that you’ve checked the box for Page Attributes. In case you then still don’t see the Page Attributes panel in your WordPress dashboard, please disable your plugins and also ensure that everything within your WordPress installation is installed correctly and up-to-date. Page Attributes is selected, but I only have the option of Parent and Order. I don’t get to choose a template. Hi Kathleen, the information here is in first place about WordPress themes by MH Themes. If you’re using not one of our WordPress themes, then it’s possible that the theme you’re using doesn’t offer additional page templates. Thanks for the guide, that did the trick for me. I am not using one of your WordPress themes, but I’m trying to make a static front page. I have created a page named Home and made it the default front page. But it has the word Home in the middle of the image, which I don’t want. Any thoughts? Hi Jo, how site elements on your website look depends on how your WordPress theme has been designed. If the site title on your website is displaying in the middle of an image (probably featured image), then this is how your theme is supposed to look like. You could contact the developers of your WordPress theme and ask if there is an option or other way to change this.